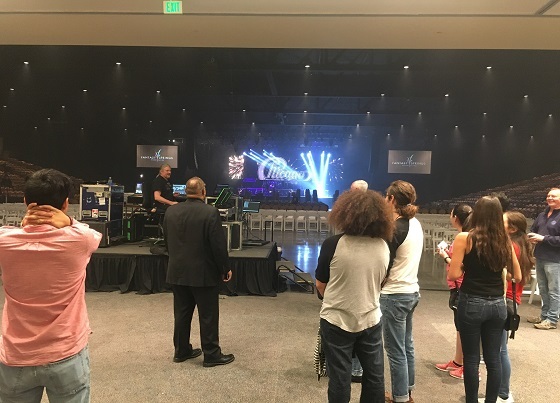 Indio, CA: The Greater Coachella Valley Chamber of Commerce (GCVCC) Future Leaders got to experience what it’s like to prep for a large scale concert this weekend thanks to the team at the Fantasy Springs Special Events Center. The kids got an up close look at the mechanics behind a professional stage and sound operation. “We love hosting the kids” said Paul MacKey, a member of the GCVCC Board of Directors and part of the Fantasy Springs team that welcomed the students on Saturday. “We had quite a few kids interested in the arts among the group, so it was great to be able to show them all the behind the scenes work that goes into this.” The tour took them through a brief oral history of the venue, along with a description of the various types of events it hosts. Along the way the kids got to see a live sound and light check, stage setup, and meet with key team members like the Director of Security. The kids certainly got to see setup for a first class act. Inducted into the Rock & Roll Hall Of Fame in 2016, Chicago was the highest charting American band in Billboard Magazine’s recent Hot 200 All-Time Top Artists, coming in at number 9. In addition, Chicago is the first American rock band to chart Top 40 albums in six decades. There concert at Fantasy Springs was sold out. About the Future Leaders Program: Instituted in 2015, the Future Leaders program is operated by the GCVCC at local high schools. The aim of the program is to expose local high school students to career opportunities that exists right here in the Coachella Valley. The Future Leaders Program encourages kids to return to the valley after college and invest their education back into their community.